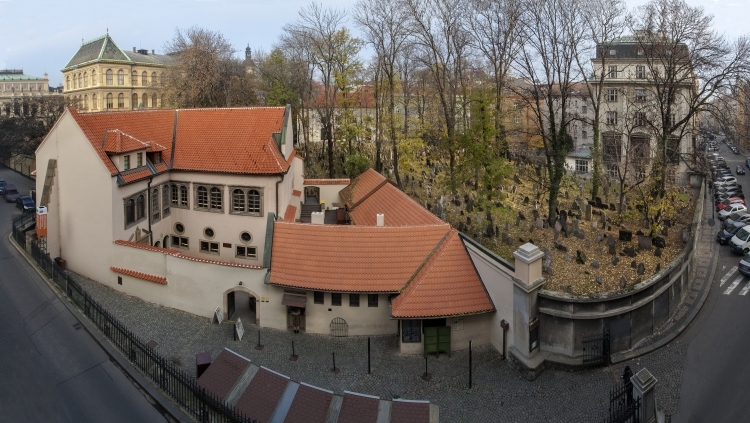 One of the most significant and richest members of the Prague Jewish community, Aron Mešullam Zalman Horowitz (Hořovský) built a private chapel between his own house and the Old Jewish cemetery in 1535. His grandson, Rabbi Pinkas Horowitz, named in Pinkas school. It is a late-Gothic building with elements of early Renaissance. The narrow, single-aisle area was influenced by the link to the old built-up area. The building has a tracery vault with intersecting ribs, there are 5 windows with stone traceries, and walls reinforced by supporting pillars. The entrance portal is made in an early-Renaissance style. Painted decoration imitates Renaissance stuccos. In the beginning of the 17th century, builder Juda de Herz added a southern wing and a gallery for women, a vestibule and an entrance hall, and he decorated the box for storing Torah. After the flood in 1860, the floor level was elevated via backfill by 1.5 m, and the entire facility was modernized. During a reconstruction in 1925 it was recommended to remove the embankment, but this wasn’t realized until the 50s. Remains of a very old ritual spa were discovered in archaeological research, probably a private spa of the Horowitz family. Following a reconstruction from the early 50s, the interior was adapted as a Memorial of Czech and Moravian victims of the holocaust in the period of 1954 - 1959. 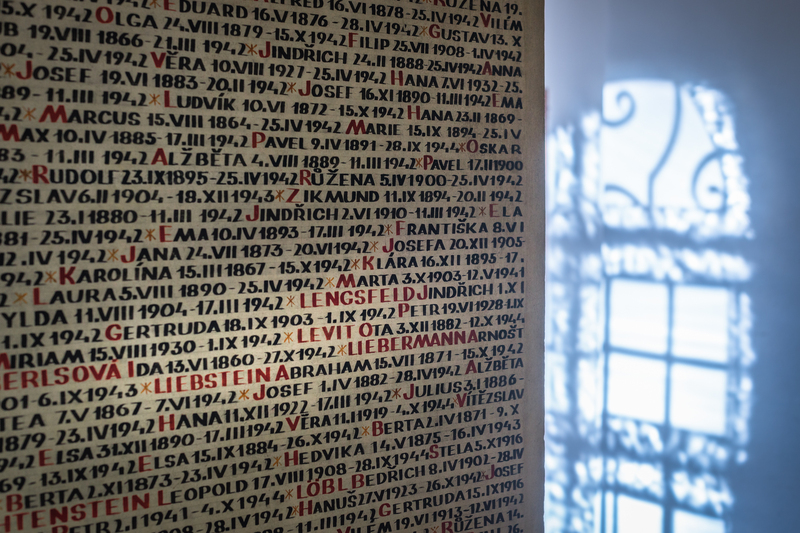 The names of the victims were written by hand and without templates on the main aisle walls, in the gallery and in the vestibule as the greatest epitaph by painters Jiří John and Václav Boštík. The names are lined alphabetically according to the towns of the last known address. There are about 40,000 people in the main aisle with the last address in Prague. If it was possible to find out family ties, then the victims from one family are next to each other. In 1968, the Memorial was closed due to increased humidity, whereas the inscriptions were damaged and gradually removed. During the 70s and the 80s, a deep insulation of the building’s foundations was carried out, the damaged truss was restored, and the attics depositories were built in. 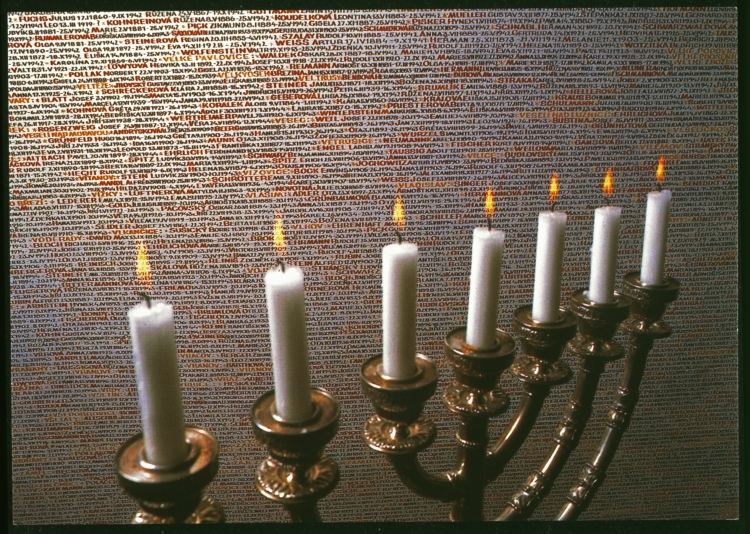 Calligraphic work on restoring the names of the holocaust victims did not start before 1992. The number of victims increased to nearly 80,000, and the search for others still continues. It is not only to remind the holocaust, but also to give human names to victims, who were only marked by numbers at the moment of death. At present, there is an exhibition of children’s drawings from the Terezín concentration camp. In August 2002, Prague was hit by flood form the Vltava river. Out of all the listed Jewish buildings, it was the Pinkas Synagogue that suffered the greatest damages. The main aisle and the synagogue’s vestibule were flooded by underground contaminated water and mud. Water level was 1.3 m above the ground floor, the basement areas were flooded completely. The statics of the building was disturbed, as well as the statics of the distance and ventilating ducts and of the vaults, electrical floor heating was destroyed together with heat and water insulations under the water level. Also the inscriptions with the names of victims on the walls were damaged and artificial marble on the bimah and aron ha-kodesh and plasters and the stone elements of the building. The first rescue restoration work was carried out by the museum workers in cooperation with external professionals immediately after the water was drawn off on the 19th August 2002. The object was cleaned with special solutions; the walls were impregnated against mould pre-emptively. The top stucco layer of the plaster was carefully removed from the places under the inscriptions for better drying. In accordance with the recommendations of the professionals, the author of the previous inscriptions created during the 90s, academic paintress Michaela Poková carried out the inspection of the state of the damaged inscriptions on the walls, and also the pre-emptive and sanitation technological procedures. Despite all the pre-emptive measures, some places suffered irrevocable changes. The inscriptions on the Eastern side of the Southern wall were completely destroyed, and will be renewed by restoration. At the same time, the repairs returned the object closer to its original architectural appearance. Construction works on restoring the monument ended on the 12th September 2003. 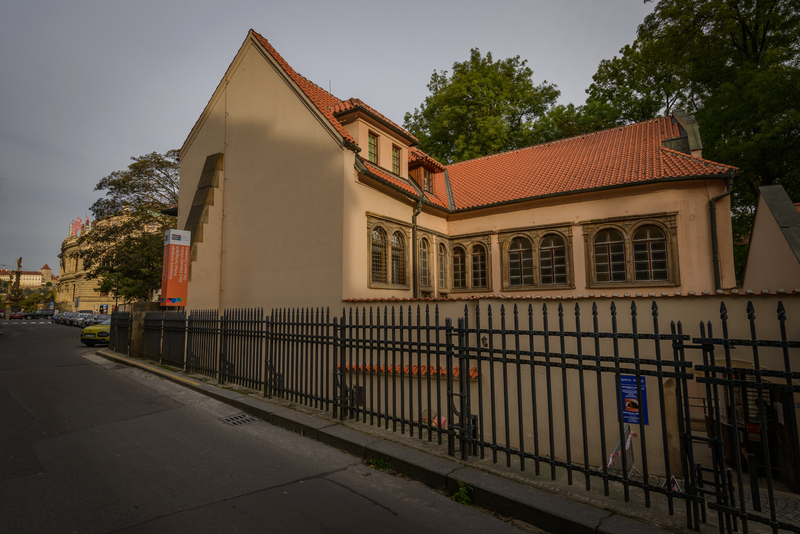 The permanent exhibition of „Children’s drawings from Terezín 1942 - 1944“ was re-installed on the synagogue’s first floor, from the collections of the Prague Jewish museum. There were more than 10,000 children among the Terezín Jewish prisoners, who had not turned 15 years of age at the time they were imprisoned. There are more than 4,000 original paintings of these children in the Museum’s depository, and they represent a very impressive testimony of their cruel fate, and most often also the only commemoration of those who did not survive. The object of the Pinkas Synagogue is administered by the Prague Jewish museum.